These are a really great way to start the day. Not only do they taste great, they are packed with protein and fiber. The cheese also gives you calcium. You will need a 12 regular size muffin cup pan. Grease the cups. In a skillet, fry the bacon until as done as you like. Remove and drain on paper towels. Pour the bacon grease into a measuring cup. You want 1/4 cup so it you don’t have that, add a little oil or extra bacon grease to get the right amount. In a mixing bowl: mix the flour, flax meal, baking powder, and salt. Pour in the bacon grease and stir to distribute it evenly. It will clump some, but as long as it has been mixed throughout the flour that’s fine. Stir in the cheeses and the bacon. Beat the milk and egg together in another bowl and stir into the flour mixture. Divide the batter evenly between all the muffin cups. Bake for 15-20 minutes until the tops are golden and the tops spring back when lightly touched. Loosen in pan, but let them sit for a few minutes. Great warm or room temperature. 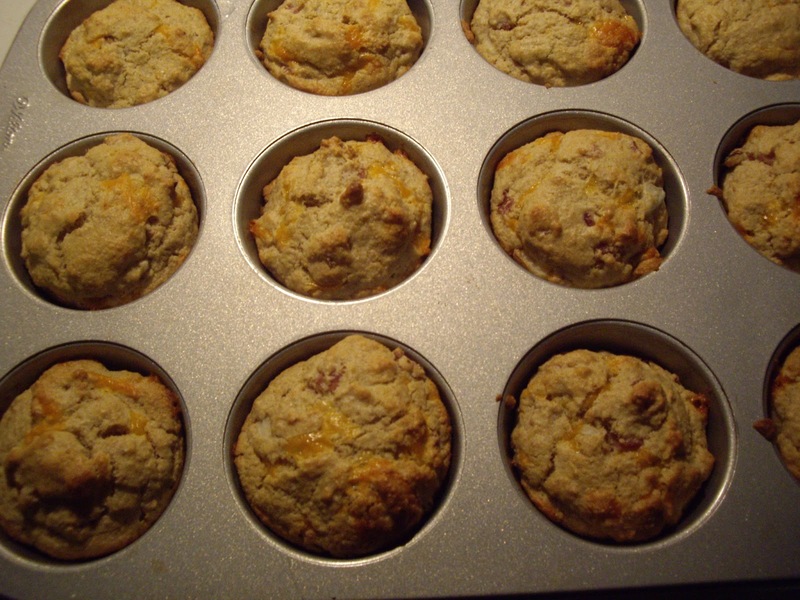 Due to the lack of gluten in these muffins, they do not rise quite as high as regular muffins made with wheat flour. To make your own oat flour: grind oats in a food processor or spice grinder. I use my spice grinder. I can’t do as much at a time, but I can get a finer grind than I can in the food processor. You can also buy oat flour in the grocery store or online.